This article relates to the Geminid meteor shower in 2017 – see the article covering 2018 here. This year’s Geminid meteor shower takes place from 4th December to the 16th December with peak activity on the evening of the 13th December through to the morning of 14th December. During the peak up to 120 meteors per hour might be seen with the best time to see them being from midnight through to dawn. Named after the constellation Gemini from which the meteors appear to radiate this meteor shower is slightly different to others that occur throughout the year. 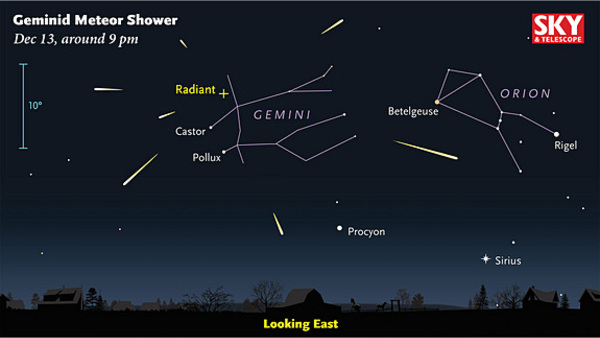 Most meteor showers are caused by dust particles from comets burning up in the atmosphere, however in the case of the Geminids it’s caused by the debris from an asteroid named “3200 Phaethon”. Geminids are renowned for their bright display and sometimes appear as green flashes due to the material they are made of. Peak activity coincides with a waning crescent moon meaning the moon’s natural light pollution should not affect observing. Darker skies mean more meteors might be seen and therefore it’s worthwhile travelling to a dark sky site to get away from man-made light pollution. As always wherever you choose to go first tell someone where you are going, wrap up warm, take some hot drinks and be patient! Good luck spotting them! Join local astronomer Liam Reid for an evening of astronomy and stargazing from the wonderfully dark village of Stonehaugh. Meeting of Bridgewater Astronomical Society including talk about a 'featured constellation' and a stargazing session weather permitting. New members of all ages and abilities are always welcome with no obligations! Join the members of Plymouth Astronomical Society for this meteor observing session at Wembury Beach Car Park. Please contact the society if you plan to attend. Witness the amazing Geminids meteor shower from the fantastic location of Crawick Multiverse and spot shooting stars with the guidance of local astronomer Steve Owens. Join members of Breckland Astronomical Society for this free public event to see the Geminids meteor shower from their observatory including observing through their 20 inch telescope. Wrap up warm, hot drinks available and heaters inside. Join members from the White Peak Astronomical Observing Group for this special event timed to coincide with the maximum of the Geminids meteor shower. Please confirm your attendance with the group via Facebook prior to travelling. Join members from Wolverhampton Astronomical Society for this observing session timed to coincide with the peak of the Geminids meteor shower. This event is weather dependent -- please check with the event organisers before travelling! Join members of Torbay Astronomical Society as they open their observatory for an evening of stargazing. Non-members welcome for a small fee. Regular "last Friday of the month" meeting (this one has moved to 15th December due to Christmas) of the Ashford Astronomical Society with presentation / talk and observing afterwards (weather permitting). Join members of the North Pennines Astronomy Society for this one of their regular stargazing sessions at the North Pennines Observatory. This event will take place over the weekend with the exact evening dependent on weather conditions. Join members from Crawley Astronomical Society for this observing session on the evening of the Winter Solstice, organised in association with Crawley Borough Council. Join members of Sheffield Astronomical Society for this one of their regular weather-dependent observing evenings with stargazing from the sports field next to the Sportsman Inn. Join local astronomer Steve Owens for this fantastic dark sky stargazing experience from the impressive location of Crawick Multiverse. Members of the public are welcome to join St Neots Astronomy Association for this observing evening at Paxton Pits Nature Reserve. First attendance free of charge. Tour of the history telescopes at the Norman Lockyer Observatory to include a short talk, planetarium presentation, tour of the technology centre and observing if clear. Entrance fee applies, no need to pre-book.